BMX bikes aren’t just for kids – vertically challenged adults who can’t bear to say goodbye to their youth can have just as much fun on a BMX as any kid. In fact anyone can have a go at riding stunts on a BMX bike, although a BMX bike does make a great gift for kids and teenagers if you are feeling particularly generous. 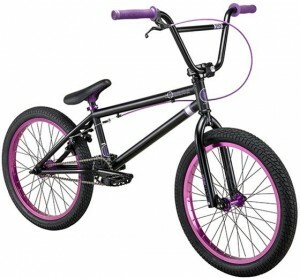 So if you or your kids have aspirations to do some hard riding in your neighbourhood, the Kink Launch 2013 is a great entry level BMX bike for beginners through to intermediate riders. Kink is a well known brand in the world of BMX bikes. They are endorsed by riders in BMX magazines, videos and competitive BMX tournaments all over the world, so if you buy a Kink bike, you can be sure you are going to get great value for money. The bike is suitable for riders between 5’2” and 5’7”. The Kink Launch 2013 can be used anywhere – trails, the street, ramps and the local park – and is sturdy enough to cope with all kinds of different terrain. It also looks very cool out on the street. The Kink Launch 2013 comes in two great colour schemes: red with a yellow trim or black with a pink trim. Both look good, so you may be spoilt for choice. For a budget bike, the Kink Launch 2013 is well kitted out with some top quality components, so unlike some other cheap BMX bikes on the market, this one won’t fall apart after a few weeks. The bike is strong and more than capable of withstanding a lot of intensive riding on different surfaces. There is not much to say of a negative nature, but as with all bikes, if you have no experience of assembling a bike from scratch, you may find it hard to put this one together if you buy it mail order. Be aware that flat pack bikes are best assembled by a professional so make appropriate arrangements for this before placing an order. You are entirely free to assemble the bike yourself upon taking delivery of it, but unless the bike has been put together by a professional, you run the risk of invalidating the Kink warranty. The Kink Launch 2013 is a fun and funky entry level BMX made by a quality manufacturer and endorsed by some of the biggest names in the business. Buy this bike and you can look forward to hours of happy riding, and as long as the bike is properly assembled in the beginning, you are unlikely to experience any problems with it. The Kink Launch is perfect for beginners to BMX riding, but it will also suit riders up to intermediate or even expert level. This entry was posted in Bikes, BMX, Kink, Reviews and tagged BMX, BMX Bikes, Kink, Kink BMX Bikes, Kink Launch 2013. Bookmark the permalink.